Searching for some of the best entertainment during your stay at the Bottger Mansion of Old Town? Then look no farther than the KiMo Theatre in Albuquerque! This iconic building is known for its stunning architecture, memorable performances, and ghosts! Here is everything you need to know about the Kimo Theater and how to get the most out of your visit. 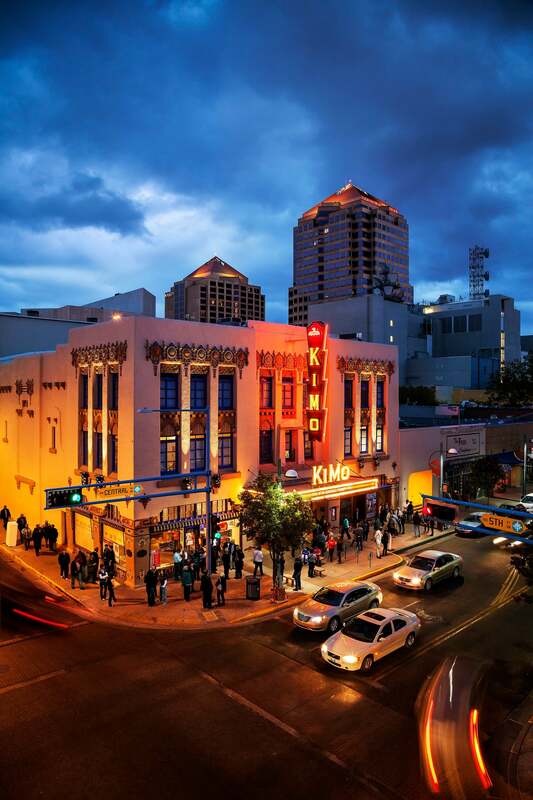 The KiMo Theater in Albuquerque is just one of the many places to enjoy incredible performances and films! When you download your free copy of our Albuquerque Vacation Guide, you’ll instantly receive a full list of the best recommendations for local entertainment, attractions, dining, and more. Since the KiMo Theatre opened its doors in September of 1927, it has awed visitors with its Pueblo Deco architecture. While this style of architecture was short-lived, it fused the spirit of Native American culture with the exuberance of Art Deco. Native American motifs appeared at only a handful of theaters during this time, and the KiMo Theatre in Albuquerque is stunning! The theater put on hundreds of fabulous performances for nearly 40 years before a large fire in the 1960’s nearly destroyed the stage and other adjacent areas. The theater fell into disrepair and was slated for demolition. However, the community came together to save their historic landmark in 1977. Restoration began that year, and soon the KiMo Theatre was listed on the National Register of Historic Places. Today, patrons can enjoy live stage productions, music, films, and much more. With such an extensive history, the KiMo Theatre is supposedly home to a few ghostly residents. Patrons have reported seeing a woman in a bonnet wandering the halls and coming and going as she pleases. She never disturbs anyone, so the workers believe she is a friendly spirit. However, the best-known ghost at the theater is the spirit of Bobby Darnell, who died in a 1951 boiler explosion. He has been known to play impish tricks upon staff and guests and play on the staircase. These chilling encounters have made the KiMo Theatre a stop on many local ghost tours. Sign up for one of them and hunt for the ghostly inhabitants yourself! You’ll find never-ending opportunities for adventure waiting for you in New Mexico! While you’re here, stay with us at the Bottger Mansion of Old Town, a historic bed and breakfast in Albuquerque, NM. We provide comfortable rooms, outstanding amenities, and friendly hospitality, along with a warm, delicious breakfast served first thing in the morning that will help you start your day off right. 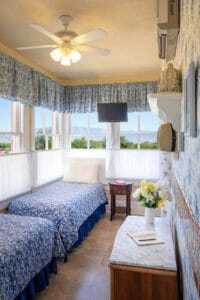 Explore the many attractions of Albuquerque or simply relax in the peace and quiet of our cozy inn. Our beautiful haven in New Mexico is waiting for you, so check our availability and book your stay today! Want to have the vacation of a lifetime in New Mexico? Find all the best restaurants, attractions, activities, and so much more by downloading our free Vacation Guide, your must-have resource for the many things to do in Albuquerque.